Here's an example of how a picture can be grainy, selectively unsharp, and unconventionally composed, and yet still be...well, perfect. This great shot of former Major League pitcher and Ball Four author Jim Bouton by photographer Ancil Nance was first featured on T.O.P. in a posting last October. Ancil has kindly cooperated with me to help make a T.O.P. fine print available. It was August 5th, 1977, at Multnomah Stadium (now PGE Park) in Portland, Oregon. 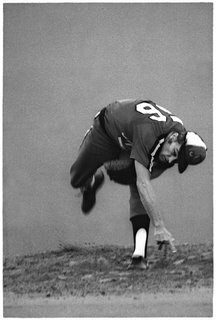 Bouton, who'd retired from the Major Leagues in 1970, the same year his famous book was published, was making a comeback pitching for Bing Russell's Minor League Portland Mavericks (you've probably heard of Bing's son Kurt, also once a Maverick but now famous as an actor). Nance was on assignment for the Oregon Times, charged with getting a shot of Bouton's famous "hat trick" that he used to distract batters. (Nance got that shot too.) "I was someplace behind the backstop trying to shoot over and through the catcher and ump," he says. 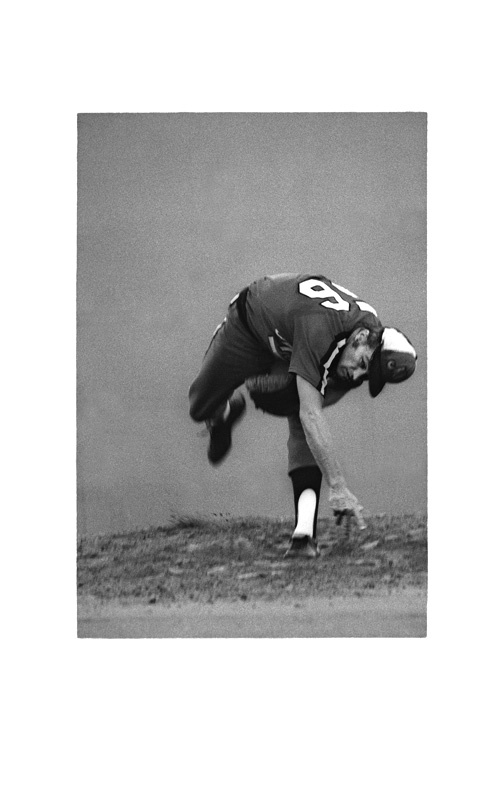 Formally, the odd shape the pitcher's body makes simultaneously emphasizes athletic effort and graceful balance. The back wall, brought close by the telephoto, seems almost like a dark cloud (I removed a distraction from the left edge), and the blank space at the top suggests the position his upper body occupied just moments before. His hat nearly touching the center of the edge of the frame provides the composition with dynamism and directionality. The white accents are what give the print its tonal vividness. Although the picture has plenty of selective motion blur, you can easily recognize that it's Jim Bouton. Our print is made from a large new scan provided by the photographer. The image is 5 x 7.5 inches, printed with carbon pigment inks on a larger sheet of Moab Entrada Natural. Apropos our discussions in the "On Printmaking" post, in this case the photographer was sent a proof for approval and shares the proceeds. A small number of signed prints are available for a higher price. Unsigned prints will be shipped this coming week; signed prints will require a delay of up to several weeks. Apart from the photographer's signature, the signed and unsigned prints are identical. Worldwide shipping is included in the price—Priority Mail within the U.S., Airmail elsewhere in the world. This is a lovely little print, and I'll say again what I said last October: have you ever seen a better picture of a pitcher? Here's my own answer: there may be some others as good, but none better. It's going up on my wall. Many thanks to Ancil Nance for agreeing to make this offer possible. P.S. If you happen to be a baseball fan and know of any baseball sites or forums, I'd be grateful if you'd mention this offer and/or provide a link. I'm sure there are baseball fans out there who don't normally collect photographs who might want to know about this. Thanks! I'd never seen the other pictures in this sequence before. They show the telltale out-of-focus donuts from a mirror lens. FYI -- I sent a heads up re the print to my favorite baseball site: Baseballthingfactory.org. THANKS. That's really great of you, and we both appreciate it (I mean Ancil and me). We need help getting the news to baseball folks.